I reviewed this title for Booklist. Here are further thoughts. Many of us think about writing memoirs these days, regardless of whether there has been any drama in our lives. It may be that the talent of the writer and the life of the mind are more important than events, but many of us do not have the goods to deliver to a wide audience. One who does is Brandon R. Schrand, who has found a very clever way to present his unlikely life in Works Cited: An Alphabetical Odyssey of Mayhem and Misbehavior. Schrand is a reader, though he came to serious literary books rather late compared with many others now in literary professions. He wanted to be a rock musician and neglected most of his studies in public school. With very suspect grades, he enrolled in college to avoid working in the mines of Idaho and because college was a place to find women, booze, and drugs. That he would end up an English professor and writer is an unlikely end. I did not spoil the ending of Works Cited just now, for Schrand himself lets you know the outcome early in the process. Nothing about his book is chronological. Instead, he has written 27 essays about books that have altered the course of his life, and as the title states, the essays are placed in alphabetical order by author. So readers jump back and forth in time learning about Schrand as he remembers reading Edward Abbey, Ralph Waldo Emerson, F. Scott Fitzgerald, Nick Hornby, Jim Morrison of the Doors, Hunter S. Thompson, and others. 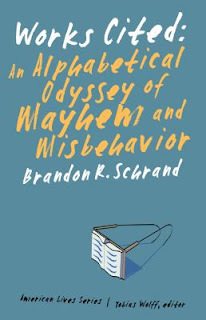 Each essay provides some of the pieces to the puzzle that is Schrand, and all pieces are necessary. It is amazing how much forgiveness Schrand has needed and received. Some readers may become exasperated, but others may see a bit of themselves or people they know. This is why we read as well as think about writing memoirs. Schrand, Brandon. Works Cited: An Alphabetical Odyssey of Mayhem and Misbehavior. University of Nebraska Press, 2013. 240p. ISBN 9780803243378.